While cherry season is still three months away I am craving the fresh fruit of summer. These pretty bars help sustain me until the day I can finally eat glorious plump cherries fresh off a tree. Heat oven to 350 degrees. Line a 9 inch square pan with foil and grease lightly with vegetable or olive oil. In a food processor add flour, sugar, salt and baking powder and process to fluff and combine. Add almond paste and almond extract and pulse to combine. Add cold butter pieces and pulse until crumbly. Remove 1 cup of the mixture and set aside for topping. Put the rest of the mixture into the pan, spread out evenly, and press with the bottom of a measuring cup to make a crust. Bake for 15-17 minutes until crust starts to brown slightly around the edges. Remove and leave the oven on. Meanwhile dump all the filling ingredients into a saucepan and cook on medium high heat until thickened some and translucent. About 8 to 10 minutes. Spread the filling over the crust. Sprinkle the top with the reserved crumb mixture and top with the sliced almonds. Bake for about 28 to 30 minutes or until the filling bubbles and the top is golden. Let cool completely in the pan on a cooling rack. Whisk or beat the icing ingredients together, drizzle over bars. Hint: To easily remove bars from the pan freeze for 30 minutes and lift out by the foil edges. Peel off foil and cut into squares or diamonds. Laura, these are just beautiful to look at. I'll bet they taste as good as they look. Mary, from you that is a huge compliment. Thank-you. This is one of my favorite recipes Ginger. The cherries and almond flavors together are very good. bad bad woman.. i love crumbly bars..and these look so beautiful! I'm craving cherry season too, especially since we just got more snow this morning. Ugh. Oh Laura! These would go great for the dessert bar that I'm doing for a wedding in May!! Do you mind if I "borrow" you recipe? I can't wait to try this! Go ahead Rhonda. I hope they enjoy them! I am new to your blog. I am a stay at home mom who loves trying new recipes. I have enjoyed clicking through your website and have bookmarked lots that I want to try. I made these bars for a holiday party tonight and they were the first dessert that was finished (I love when the food I bring is a favorite). I got a lot of requests for the recipe and gave them your website. Thanks for the delicious treats and I can't wait to try more. These cookies are positively delightful! 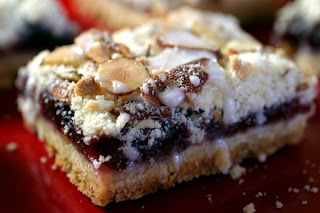 I've made them three times recently, for various holiday parties, and at each party these cookie bars were the favorite. The hardest part about making them is not eating them all myself! :-) Thanks for sharing this awesome recipe.